For today’s article we’ve been looking around for a cool app that can be used as a GPS tool for your smartphone, and we’ve found something a lot more better than the usual GPS biggies in the App Store, the Gogo Navigator app. This is probably the most needed app for all drivers who got lost and need to find a way out in the everyday concrete jungle, it not only replaces the GPS, but it’s a lot more practical that the old device you were used to. And after several searches on the internet to see what people and customers like, the new version of Gogo Navigator app has caught our attention an we’ve decided to take this app on a “ride” and see what it has to offer and i have to say, we were pretty impress. This is really a pretty cool piece of app that allows you to go from place to place, without being afraid that you can get lost. Beside the usual GPS function that you’re used to, the Gogo Navigator has a great pack of features and options that offers the most comprehensive real-time, turn-by-turn 3D navigational data available for iPhone and iPod touch users. 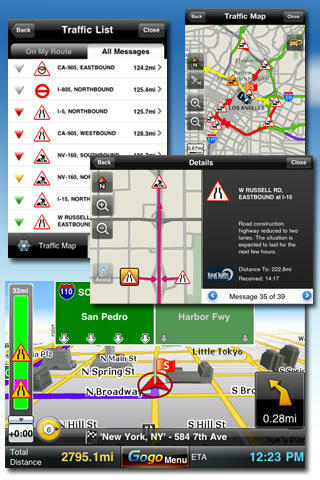 The star feature of the new Gogo Navigator app 1.2.0 version is the Live Traffic which is available as an in-app-purchase and is extraordinary helpful in times of emergency, providing you the latest traffic details such as detailed incident reports, color coded traffic flow speeds and the ability to reroute users based on incoming accident information. The Live Traffic updates minute by minute traffic and accidents with Text-To-Speech(TTS) voice guidance, and can be very easily accessed just by tapping on the “Traffic” Button in the bottom of the main menu. The Live Traffic has a “Traffic Status” icon which provides you traffic status using some color codes, and a “Traffic Bar” which updates every 30 seconds to keep you permanently informed about any road block. 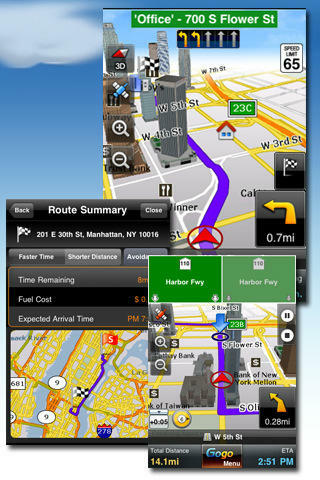 It offers an efficient and effective navigational experience for users and is available for only $8.99, and the great thing is that it doesn’t require monthly or annual renewal. Another great thing about this Gogo Navigator app is that stores the map data maps locally on your device and works without Internet connection, so if it happens to lose GPS or 3G signal, you’ll still be able to receive turn-by-turn directions. It features a really nice and clear interface with an easy-to-navigate menu and quick launch buttons and a lot of facilities including turn-by-turn 3D navigation, text-to-speech (TTS) guidance, signpost display, points of interest, favorite locations and Google Local search. What’s so great about its interface are the big buttons perfect while you’re driving, so you don’t have to stop the car and stare for five minutes on the phone’s screen to see where you’re going. 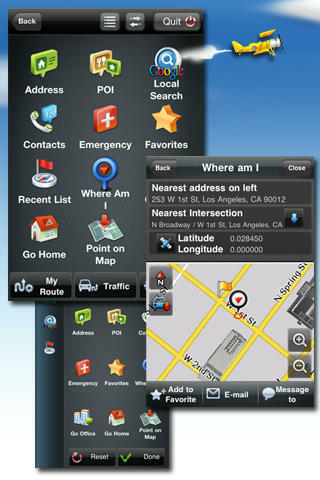 The Gogo Navigator represents a really valuable virtual travel assistant is compatible with iPhone, iPod touch and iPad, and requires iOS 3.1.3 or later. Gogo Navigator USA & CAN version 1.2.0 is currently available at the App Store, in the Navigation category, for a purchase price of $29.99 USD.